On this day in history, December 18th, last year, Mohd Elfi bin Mustapa captured the 100 meter title at the Asean University Game 2010. The biennial games in its 15th edition held at Chiang Mai, Thailand saw then NUS undergraduate winning the century sprint in 10.59 seconds with a legal wind assistance of 0.4 m/s. The 23-year-old distinguished himself in the heats by clocking 10.78 seconds (0.0 m/s) and successfully allotted the favorable Lane 4 in the finals. 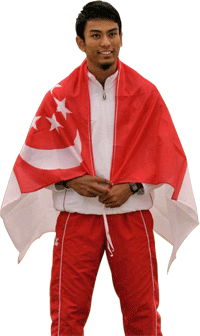 He was closely challenged by one of the pre-race favorite Indonesian sprinter Mohamed Fadlin. It proved to be an exciting contest, as only 0.01 second separated the first two men at the finish. But Elfi managed to hold on, giving a good burst in the last 15 metres to take the gold. It was to be the only gold won by Team Singapore across all sport at the games. The Economics major equaled his personal best which was first set in Taipei, Taiwan the year before. Elfi has since graduated and is currently training full-time.